The USA boasts more than its fair share of chow down joints serving some of the biggest and best dishes of deliciousness around. So now, the Travel Channel presents the most definitive and appetizing countdown food fanatics have ever seen! 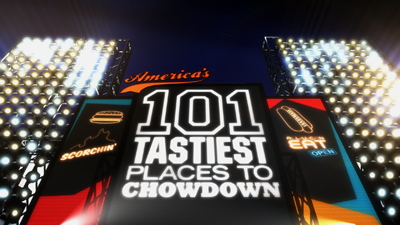 Welcome to the CHOWDOWN COUNTDOWN where five one-hour specials will take you on a non-stop, coast-to-coast, mouthwatering tour of the 101 absolute best places to get your grub on in the country. These are the go-to chow joints certified by the people who know best—the locals! And every craving and food fantasy will be satisfied—from couch cushion sized burgers to the biggest breakfast burrito in the country, and from award winning barbecue to fresh sizzling fried chicken. We’re starting at #101 on the list and making our way to the absolute #1 place to eat big in America!